Catholic Charities programs support many different populations of people experiencing transition in their lives. From men and women returning to society after incarceration, to new mothers, to unaccompanied minors who have recently come to the United States, we work with individuals to identify their needs and come up with solutions. Get involved by creating care packs that will help meet a very real need in the lives of those we serve. Gather your group of friends, your church group, your neighbors, or your family to purchase supplies and create a set of care packs at a date and location of your choice. Then, contact the program to determine a time and location to deliver the kits. 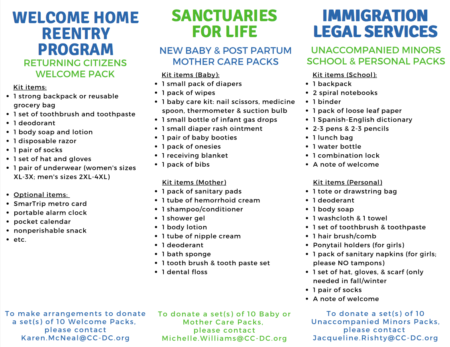 We are currently in need of packs to support three programs.